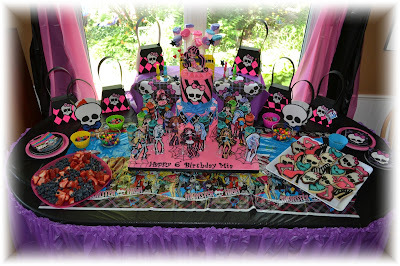 My little sister's birthday was all about Monster High! 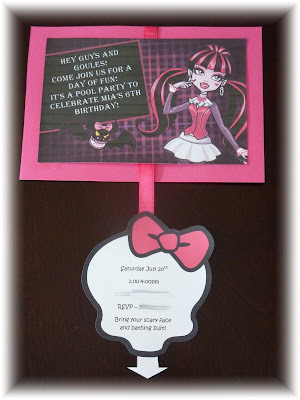 She had no idea what her mom and I had planned for the party - we did everything while she was in school and because I did a lot of the work, she never saw anything until the day of her party!! It was fun trying to create this party all in secret! 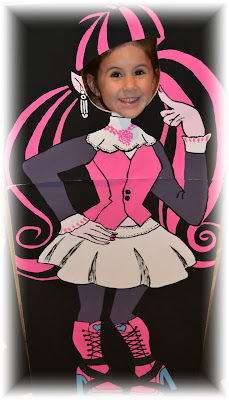 Even my daughter didn't realize that it was for Mia's birthday party! First we started with the invitations! Mia loves Draculaura so we decided to go with that! 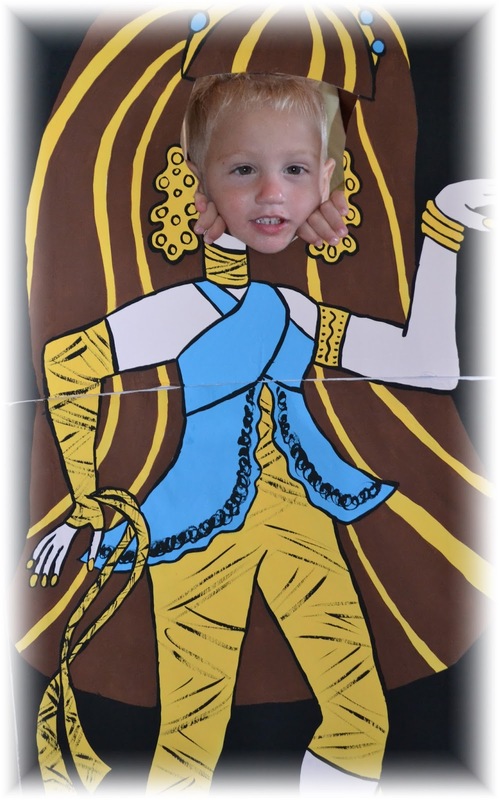 I have a great program that I bought for my digital scrapbooking - it's from Creative Memories and has made such a difference in all of my photo's and how I can edit them! 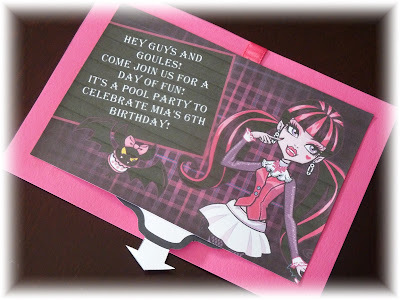 After the images were all printed and the skulls were cut out, I took the ribbon and taped it in the center of the card, wrapped it around the whole card and had it trail out the bottom of the invitation. After that I glued the card on top of the ribbon making sure to leave the bottom of the card free of glue so that the skull portion would still pull down! 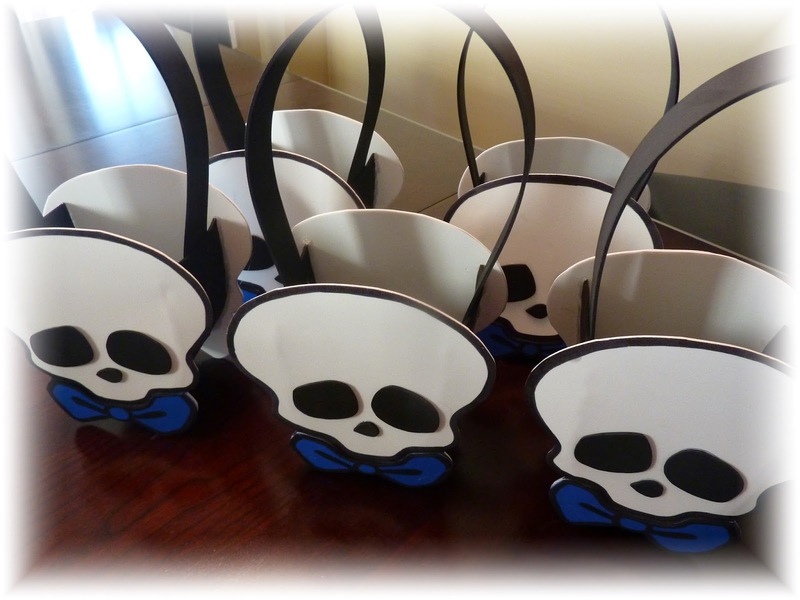 Once everything was done I tucked the skull up inside the card and the invitations were all finished! For the goody bags we thought it would be cute to give all of the little girls their very own purses! 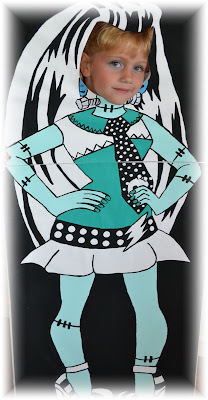 So after doing a quick google search, I found a pattern for cutting out your own paper purses! 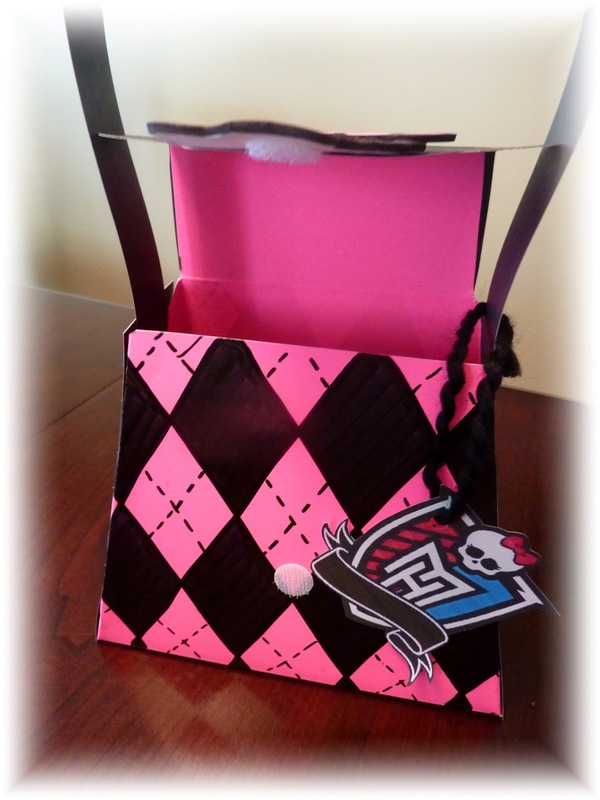 I drew up my own pattern and then was able to put together these great purses! 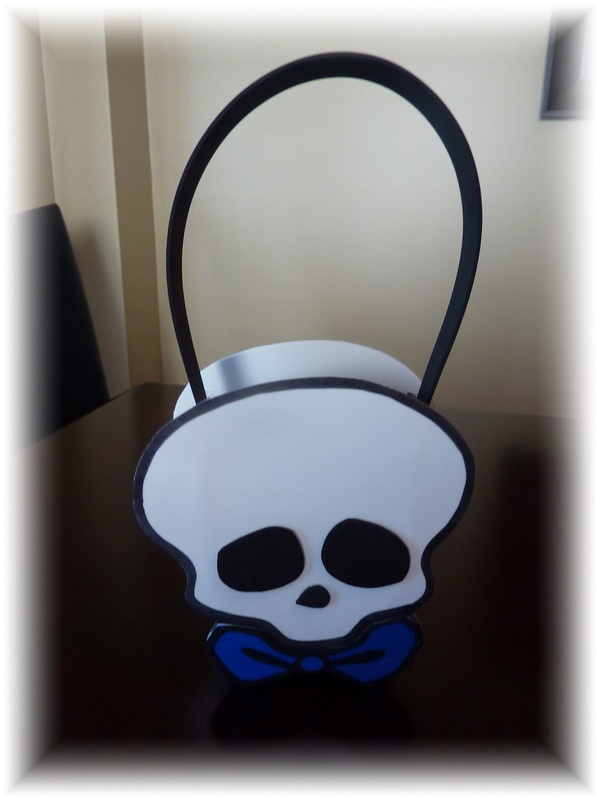 Everything is made from Bristol board except for the skulls - those were made with foam, and I stuck Velcro dots on the backs so that the girls could close their purses! I even made these little Monster High tags to hang off the sides of the purses - we used a silver pen to write each girls name on their goody bag! 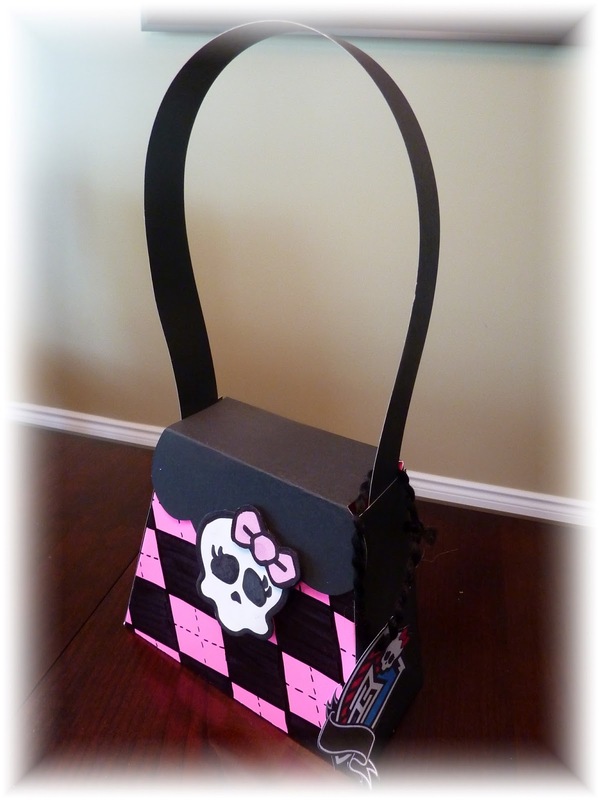 The boys couldn't very well be going home with pink purses but we wanted to keep with the same theme, so we went with the Monster High skull, changed the position of the bow as well as the colour! Huge hit with the boys! 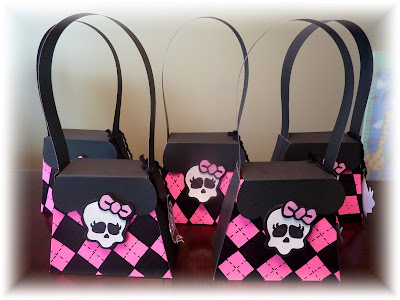 These bags were made out of the same foam as the Super Mario goody bags that I made for my daughters party! This party was a pool party but we still wanted to have some fun activities for the kids to do in between swimming! So I thought it would be a lot of fun for the kids if they could pretend to be the Monster High characters! 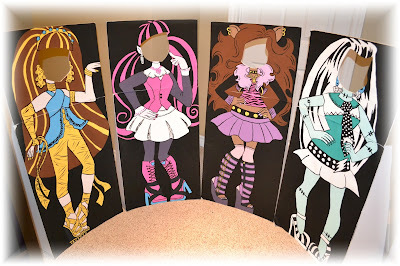 I used foam core and painted the images of four of the characters onto the boards. In all honesty I was not impressed with how they turned out - don't get me wrong, I love how they looked and the kids had a blast playing with them, but I found that the paint caused the paper on the foam core to peel away from the boards! It was frustrating, but at least I have ideas for the next time now! 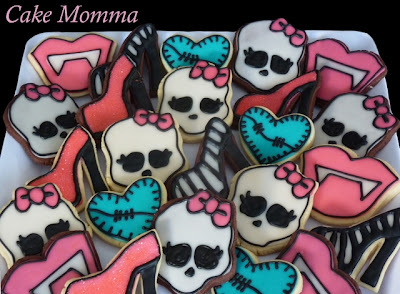 I plan on trying something a little different next time I make these for a party! Even the boys had fun with these!!! 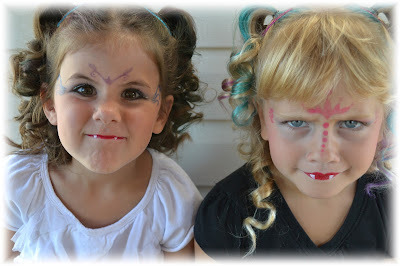 The girls had lots of makeup on too for the party and I was even able to paint little fangs on their lips!! lol!! Ohhhhh, so scary right! Now for the cake!! We thought we would go with something a little different this year - so we bought push pops from Micheals (don't forget your coupons!) - these little treats are a lot of fun and the kids love them! Perfect portion sizes for the little munchkins! And they are re-useable - just make sure everyone knows not to throw them out! 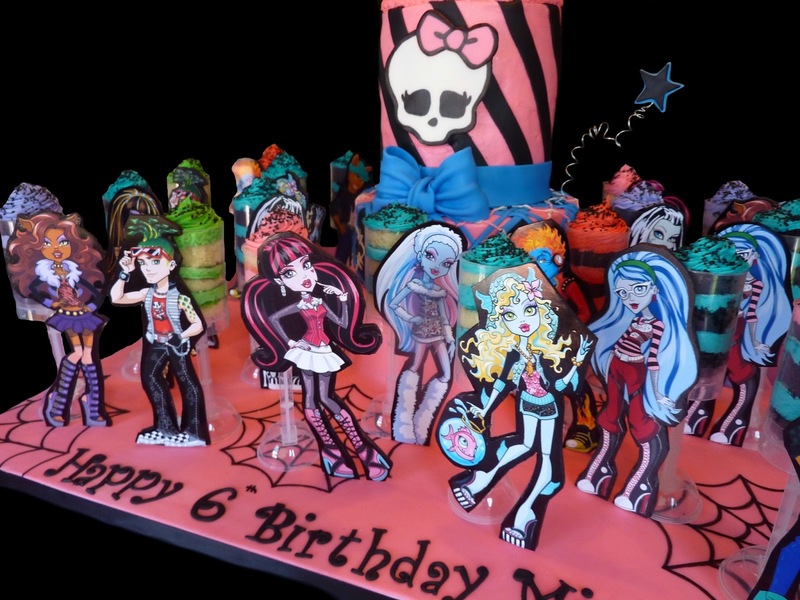 The push pops were perfect, I was able to incorporate all of the main characters into the cake with these! And the kids all got to take home their characters! 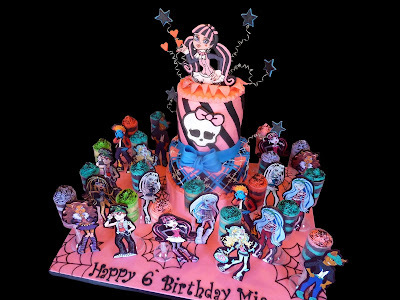 The cake was an 8" cake to feed the grown ups and the rest was Styrofoam! 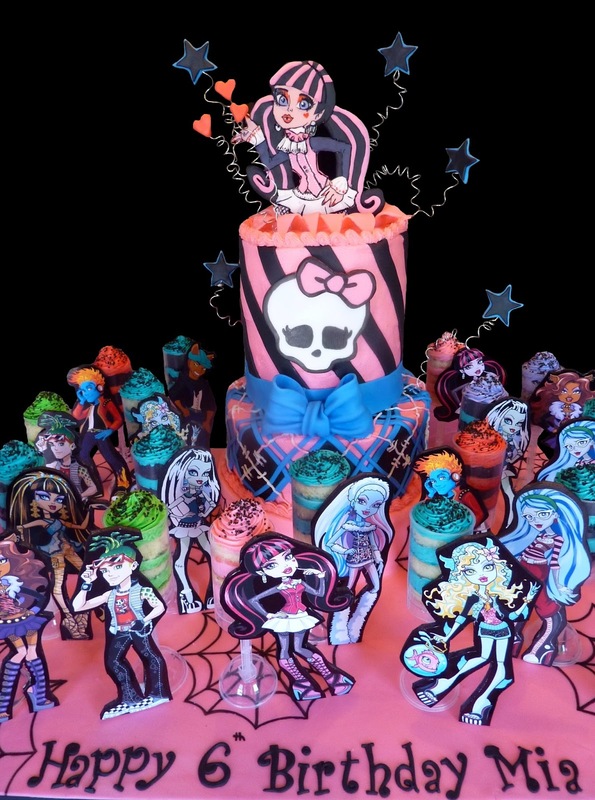 You don't always need a ton of cake to get a big effect! The Monsters are print outs that have been glued onto foam core and then cut out! I then just added a little hot glue and attached them to their colour coded cake pops! The kids LOVED them and they actually ate all of their cake! Draculaura is a piece of foam core that was covered in fondant and then painted with food colouring! The birthday girl kept this topper! I also made cookies for the party! High heel shoes, skulls, Frankie hearts, and Draculaura lips! The kids loved them - one of the little boys came up to me and said "these are the best cookies that I have ever had" - LOVE that little boy! He made my day! This is how we put everything together on the food table! I used a great technique that I found on pinterest for the table cloth! We draped the table with the black table cloth (you can find black at Walmart!) and then took two sided tape to run around the table. The I took the purple table cloth and started to loosely pleat the cloth around sticking it to the tape! It worked perfectly and I am in love with this technique! So much nicer then just a flat table cloth, and so easy to do! 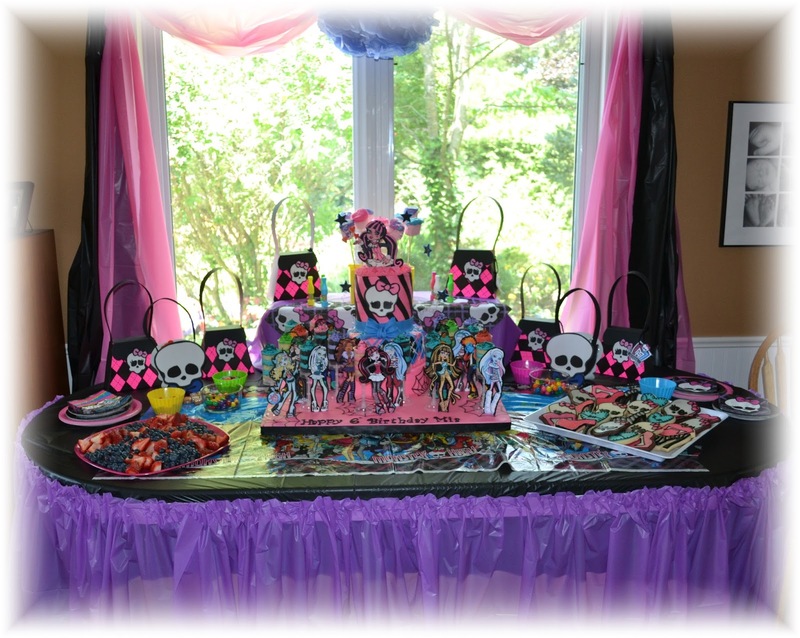 The goody bags were used in the decoration of the table and I also took a couple of table cloths and used them to decorate the window behind the table! The purple ball in the middle of the window is actually from my daughters princess party a few years ago.... it was a little mushed, but once we hung it up and fluffed it up - it didn't look too bad! These balls were made with the help of a you tube video - tissue paper balls - you can also buy them in the stores - but they are so easy to make! 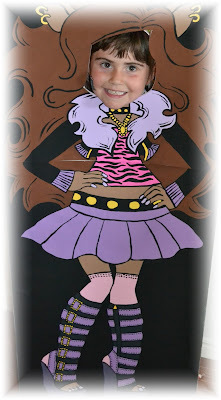 Overall the party was a hit and the birthday girl loved everything! 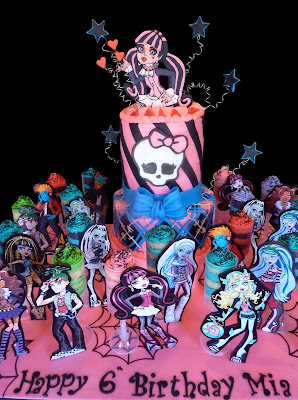 Happy birthday Mia Bean! Great party what website did you print the characters from? how did you do the boys treat bags?